“With a combination of scholarly research and highly creative imagination British author Roger Hudson has fashioned a believable and highly readable story in Death Comes By Amphora, a murder mystery that could as easily have happened in Greece’s Golden Age of Athens as in modern America…. 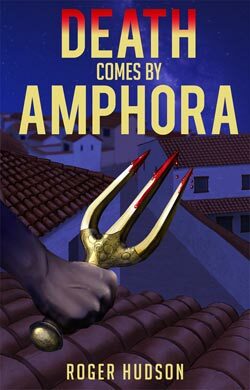 “Death Comes by Amphora is not only a pleasurable, atmospheric and illuminating read but it captivates a period of Athenian history amidst a historical political thriller and a tale of revenge. Be prepared for inrtrigue, political infighting and a fascinating look at Athenian life. “First novel by Roger Hudson, this is a good start. It allows we, the reader, to learn - a little - about the politics of Greece in 461 BC, so different from the dusty pages of idealised stories of heroes, Gods and legends. Don’t get me wrong - it isn’t only about political intrigue (however interesting it is made) but is also a corking good detective story. The motives abound and the suspects practically form a disorderly queue. There is also plenty of humour, understated but present, and the whole is highly enjoyable to read! I look forward to more episodes. “It is immediately apparent that Roger Hudson knows his classical Athens and that a vast amount of research underpins Death Comes By Amphora. That’s not to say the narrative is weighed down by unnecessary detail, but that every description, situation, noise, and smell feels absolutely authentic. “Once all the political factioneering is done with, the story becomes pretty gripping. The actual mechanics of investigating a murder when religious doctrine is keen on purifying the site of any death make a nice change from detailed forensic work. "Born and raised in England, Hudson has lived and raised his own family in Ireland. He currently lives in Drogheda where he is a novelist, film maker and photomontagist. He came to poetry relatively late in life although this is his third collection and, like the others, is characterized by thoughts and reflections on his life. The title comes from the idea of circumstances suddenly changing for no apparent reason, leaving you confused as to why a friend has become an enemy or someone suddenly says something that is wrong and hurtful. This captures the essence of the collection which delves into the intriguing, dramatic and significant incidents in Hudson’s personal life and the times he has lived through." “Hudson’s photomontages are full of an enquiring energy that dislodges the everyday into something critical and questioning about how we see the world.” “The book really looks terrific, printing, layout, images, text all work together so well - his explanation of the work is very true to the spirit of the images, which is unusual for an artist.